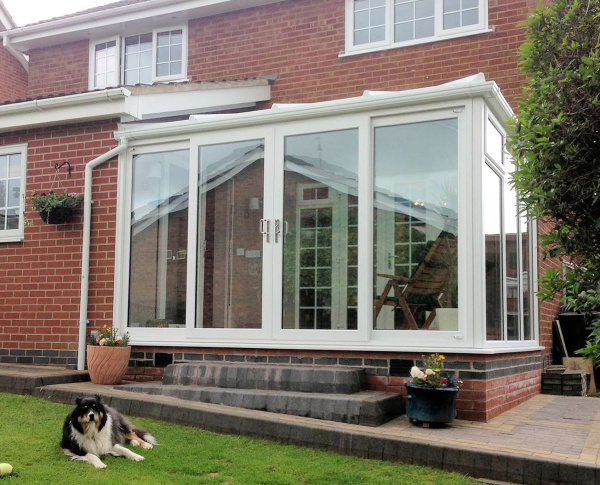 Lean-to Conservatory - With full height glass panels or have a panel section at the bottom. Made to measure at no extra costs anything can be modified. Price includes full height frames with clear double glazed low e argon filled toughened units and a set of french doors to go in one side or the front. There is also an option to upgrade the French doors to a set of sliding patio doors or ModLok bi-fold doors. We use the Liniar EnergyPlus profile on all our conservatories as standard, We don't cut a corner with cheaper profile systems. DIY Lean To 3.0m x 3.0m Conservatory Full Height Panels - Best price online ! Lean-to Conservatory with full height panels Buy direct from a conservatory manufacturer, French doors as standard or a choice to upgrade to a set of sliding patio doors or Modlok Bi-fold doors. Made to measure and any designs to suit your needs. 3000mm wide x 3000mm projection Lean-to conserv..
DIY Lean To 3.0m x 3.5m Conservatory Full Height Panels - Best Price Online! Lean-to Conservatory with Full Height Panels Buy direct from a conservatory manufacturer, French doors as standard or a choice to upgrade to a set of sliding patio doors or Modlok Bi-fold doors. Made to measure and any designs to suit your needs. 3000mm wide x 3500mm projection Lean-to co..
DIY Lean To 3.0m x 4.0m Conservatory Full Height Panels - Best Price Online! Lean-to Conservatory with Full Height Panels Buy direct from a conservatory manufacturer, French doors as standard or a choice to upgrade to a set of sliding patio doors or Modlok Bi-fold doors. Made to measure and any designs to suit your needs. 3000mm wide x 4000mm projection Lean-to co..
DIY Lean To 3.0m x 4.5m Conservatory Full Height Panels - Best Price Online! Lean-to Conservatory with Full Height Panels Buy direct from a conservatory manufacturer, French doors as standard or a choice to upgrade to a set of sliding patio doors or Modlok Bi-fold doors. Made to measure and any designs to suit your needs. 3000mm wide x 4500mm projection Lean-to ..
DIY Lean To 3.0m x 5.0m Conservatory Full Height Panels - Best Price Online! Lean-to Conservatory with Full Height Panels Buy direct from a conservatory manufacturer, French doors as standard or a choice to upgrade to a set of sliding patio doors or Modlok Bi-fold doors. Made to measure and any designs to suit your needs. 3000mm wide x 5000mm projection Lean-to co..
DIY Lean To 3.0m x 6.0m Conservatory Full Height Panels - Best Price Online! Lean-to Conservatory with Full Height Panels Buy direct from a conservatory manufacturer, French doors as standard or a choice to upgrade to a set of sliding patio doors or Modlok Bi-fold doors. Made to measure and any designs to suit your needs. 3000mm wide x 6000mm projection Lean-to conserv..
DIY Lean To 3.0m x 7.0m Conservatory Full Height Panels - Best Price Online! Lean-to Conservatory with Full Height Panels Buy direct from a conservatory manufacturer, French doors as standard or a choice to upgrade to a set of sliding patio doors or Modlok Bi-fold doors. Made to measure and any designs to suit your needs. 3000mm wide x 7000mm projection Lean-to co..
DIY Lean To 3.0m x 8.0m Conservatory Full Height Panels - Best Price Online! Lean-to Conservatory with Full Height Panels Buy direct from a conservatory manufacturer, French doors as standard or a choice to upgrade to a set of sliding patio doors or Modlok Bi-fold doors. Made to measure and any designs to suit your needs. 3000mm wide x 8000mm projection Lean-to co..
DIY Lean To 3.0m x 10.0m Conservatory Full Height Panels - Best Price Online! Lean-to Conservatory with Full Height Panels Buy direct from a conservatory manufacturer, French doors as standard or a choice to upgrade to a set of sliding patio doors or Modlok Bi-fold doors. Made to measure and any designs to suit your needs. 3000mm wide x 10000mm projection Lean-to c..
DIY Lean To 3.5m x 3.0m Conservatory Full Height Panels - Best Price Online! Lean-to Conservatory with Full Height Panels Buy direct from a conservatory manufacturer, French doors as standard or a choice to upgrade to a set of sliding patio doors or Modlok Bi-fold doors. Made to measure and any designs to suit your needs. 3500mm wide x 3000mm projection Lean-to co..
DIY Lean To 3.5m x 3.5m Conservatory Full Height Panels - Best Price Online! Lean-to Conservatory with Full Height Panels Buy direct from a conservatory manufacturer, French doors as standard or a choice to upgrade to a set of sliding patio doors or Modlok Bi-fold doors. Made to measure and any designs to suit your needs. 3500mm wide x 3500mm projection Lean-to co..
DIY Lean To 3.5m x 4.0m Conservatory Full Height Panels - Best Price Online! Lean-to Conservatory with Full Height Panels Buy direct from a conservatory manufacturer, French doors as standard or a choice to upgrade to a set of sliding patio doors or Modlok Bi-fold doors. Made to measure and any designs to suit your needs. 3500mm wide x 4000mm projection Lean-to co..
DIY Lean To 3.5m x 4.5m Conservatory Full Height Panels - Best Price Online! Lean-to Conservatory with Full Height Panels Buy direct from a conservatory manufacturer, French doors as standard or a choice to upgrade to a set of sliding patio doors or Modlok Bi-fold doors. Made to measure and any designs to suit your needs. 3500mm wide x 4500mm projection Lean-to co..
DIY Lean To 3.5m x 5.0m Conservatory Full Height Panels - Best Price Online! Lean-to Conservatory with Full Height Panels Buy direct from a conservatory manufacturer, French doors as standard or a choice to upgrade to a set of sliding patio doors or Modlok Bi-fold doors. Made to measure and any designs to suit your needs. 3500mm wide x 5000mm projection Lean-to co..
DIY Lean To 4.0m x 3.0m Conservatory Full Height Panels - Best Price Online! Lean-to Conservatory with Full Height Panels Buy direct from a conservatory manufacturer, French doors as standard or a choice to upgrade to a set of sliding patio doors or Modlok Bi-fold doors. Made to measure and any designs to suit your needs. 4000mm wide x 3000mm projection Lean-to co..
DIY Lean To 4.0m x 3.5m Conservatory Full Height Panels - Best Price Online! Lean-to Conservatory with Full Height Panels Buy direct from a conservatory manufacturer, French doors as standard or a choice to upgrade to a set of sliding patio doors or Modlok Bi-fold doors. Made to measure and any designs to suit your needs. 4000mm wide x 3500mm projection Lean-to co..
DIY Lean To 4.0m x 4.0m Conservatory Full Height Panels - Best Price Online! Lean-to Conservatory with Full Height Panels Buy direct from a conservatory manufacturer, French doors as standard or a choice to upgrade to a set of sliding patio doors or Modlok Bi-fold doors. Made to measure and any designs to suit your needs. 4000mm wide x 4000mm projection Lean-to co..
DIY Lean To 4.0m x 4.5m Conservatory Full Height Panels - Best Price Online! Lean-to Conservatory with Full Height Panels Buy direct from a conservatory manufacturer, French doors as standard or a choice to upgrade to a set of sliding patio doors or Modlok Bi-fold doors. Made to measure and any designs to suit your needs. 4000mm wide x 4500mm projection Lean-to co..
DIY Lean To 4.0m x 5.0m Conservatory Full Height Panels - Best Price Online! Lean-to Conservatory with Full Height Panels Buy direct from a conservatory manufacturer, French doors as standard or a choice to upgrade to a set of sliding patio doors or Modlok Bi-fold doors. Made to measure and any designs to suit your needs. 4000mm wide x 5000mm projection Lean-to co..
DIY Lean To 4.5m x 3.0m Conservatory Full Height Panels - Best Price Online! Lean-to Conservatory with Full Height Panels Buy direct from a conservatory manufacturer, French doors as standard or a choice to upgrade to a set of sliding patio doors or Modlok Bi-fold doors. Made to measure and any designs to suit your needs. 4500mm wide x 3000mm projection Lean-to co..
DIY Lean To 4.5m x 3.5m Conservatory Full Height Panels - Best Price Online! Lean-to Conservatory with Full Height Panels Buy direct from a conservatory manufacturer, French doors as standard or a choice to upgrade to a set of sliding patio doors or Modlok Bi-fold doors. Made to measure and any designs to suit your needs. 4500mm wide x 3500mm projection Lean-to co..
DIY Lean To 4.5m x 4.0m Conservatory Full Height Panels - Best Price Online! Lean-to Conservatory with Full Height Panels Buy direct from a conservatory manufacturer, French doors as standard or a choice to upgrade to a set of sliding patio doors or Modlok Bi-fold doors. Made to measure and any designs to suit your needs. 4500mm wide x 4000mm projection Lean-to co..
DIY Lean To 4.5m x 4.5m Conservatory Full Height Panels - Best Price Online! Lean-to Conservatory with Full Height Panels Buy direct from a conservatory manufacturer, French doors as standard or a choice to upgrade to a set of sliding patio doors or Modlok Bi-fold doors. Made to measure and any designs to suit your needs. 4500mm wide x 4500mm projection Lean-to co..
DIY Lean To 4.5m x 5.0m Conservatory Full Height Panels - Best Price Online! Lean-to Conservatory with Full Height Panels Buy direct from a conservatory manufacturer, French doors as standard or a choice to upgrade to a set of sliding patio doors or Modlok Bi-fold doors. Made to measure and any designs to suit your needs. 4500mm wide x 5000mm projection Lean-to co..
DIY Lean To 5.0m x 3.0m Conservatory Full Height Panels - Best Price Online! Lean-to Conservatory with Full Height Panels Buy direct from a conservatory manufacturer, French doors as standard or a choice to upgrade to a set of sliding patio doors or Modlok Bi-fold doors. Made to measure and any designs to suit your needs. 5000mm wide x 3000mm projection Lean-to co..
DIY Lean To 5.0m x 3.5m Conservatory Full Height Panels - Best Price Online! Lean-to Conservatory with Full Height Panels Buy direct from a conservatory manufacturer, French doors as standard or a choice to upgrade to a set of sliding patio doors or Modlok Bi-fold doors. Made to measure and any designs to suit your needs. 5000mm wide x 3500mm projection Lean-to co..
DIY Lean To 5.0m x 4.0m Conservatory Full Height Panels - Best Price Online! Lean-to Conservatory with Full Height Panels Buy direct from a conservatory manufacturer, French doors as standard or a choice to upgrade to a set of sliding patio doors or Modlok Bi-fold doors. Made to measure and any designs to suit your needs. 5000mm wide x 4000mm projection Lean-to co..
DIY Lean To 5.0m x 4.5m Conservatory Full Height Panels - Best Price Online! Lean-to Conservatory with Full Height Panels Buy direct from a conservatory manufacturer, French doors as standard or a choice to upgrade to a set of sliding patio doors or Modlok Bi-fold doors. Made to measure and any designs to suit your needs. 5000mm wide x 4500mm projection Lean-to co..
DIY Lean To 5.0m x 5.0m Conservatory Full Height Panels - Best Price Online! Lean-to Conservatory with Full Height Panels Buy direct from a conservatory manufacturer, French doors as standard or a choice to upgrade to a set of sliding patio doors or Modlok Bi-fold doors. Made to measure and any designs to suit your needs. 5000mm wide x 5000mm projection Lean-to co..